To replace the screen in an old-fashioned wood frame, follow the instructions below for a taught screen. With just a few simple tools, you can replace the old window and once again enjoy the breeze bug-free. It's best to paint the frame and trim before attaching the screen, so allow time for the paint to dry. Do not use vinyl screen. This stretches badly and is difficult to work with. Aluminum screen provides a better replacement and does not stretch. Paint the frame and trim before installing the screen and trim molding. Remove the wood frame from the window. Our unit was hinged so we simply removed the slotted screws. Using screw driver and pliers, remove the old damaged screen. 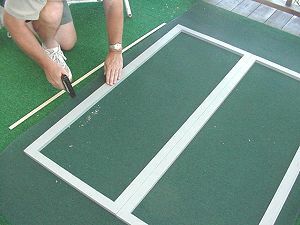 Lay the replacement aluminum screen over both windows sections and staple the outer edge on both sides. When stapling the screen, space the staple about 6 inches apart and staple close to the interior edge of the wood frame. Lift the outer edges of one frame and select a drill bit (try 1/8 inch) to place between the screen frames. When you lay the frame back down, this will stretch the screen.